Victoria Secret. No one would have ever thought I would eventually grab a piece of this brand. My Boss handed over a cute little Pink Striped Bag with the Victoria Secret Logo Stamped on and my face Lit up. She had been on a trip to Brazil and got me something small which I thought was a sweetest thing ever. 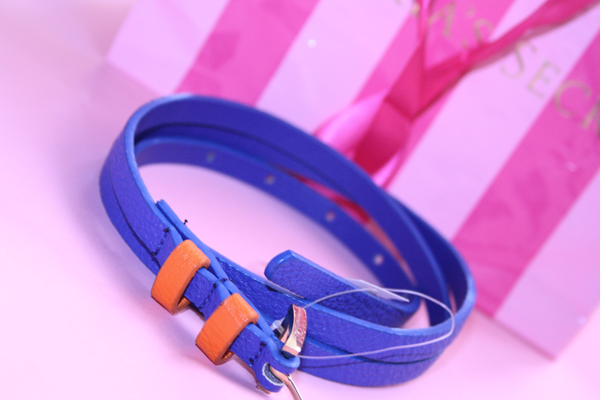 To my surprise was this lovely Blue/Orange belt with Gold Buckle that is the perfect colour for this Spring/Summer! Its Bright and It's utterly Fabulous. I already have some ideas for outfits to use it with as I would want it as a statement piece to make it pop and stand out. This is my first piece from Victoria Secret but I will definitely have a look at other pieces as I am always drooling over their bikini line! HAVE YOU EVER GOTTEN A GIFT THAT YOU JUST LOVE? They have some gorgeous pieces! !